A Tooth Loss occurs is when the tooth falls out of its original position in the gum line, due to a traumatic injury or massive tooth decay. What is Traumatic Tooth Loss? A Traumatic Tooth Loss occurs when the tooth falls out of its original position in the gum line, due to a traumatic injury or massive tooth decay. What are the Causes of Traumatic Tooth Loss? What are the Signs and Symptoms of Traumatic Tooth Loss? 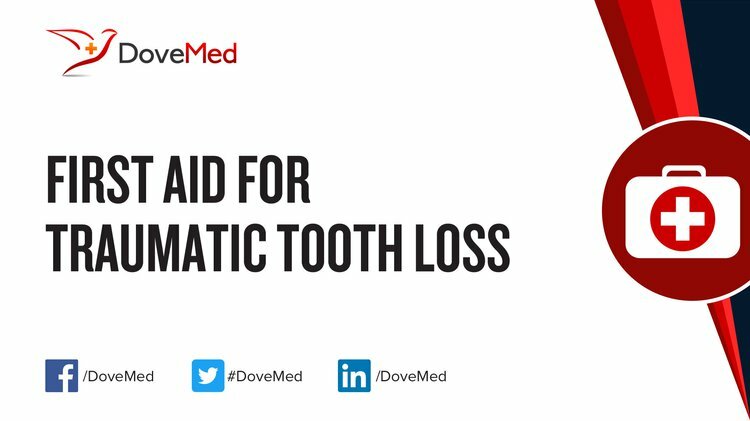 How is First Aid administered for Traumatic Tooth Loss? Who should administer First Aid for Traumatic Tooth Loss? The individual who is affected, or someone near should administer initial first aid, following which one should seek emergency dental surgery. What is the Prognosis of Traumatic Tooth Loss? The prognosis of Tooth Loss is dependent on the damage to the root of the teeth and the trauma to the gum line. How can Traumatic Tooth Loss be Prevented? Gerritsen, A. E., Allen, P. F., Witter, D. J., Bronkhorst, E. M., & Creugers, N. H. (2010). Tooth loss and oral health-related quality of life: a systematic review and meta-analysis. Health and quality of life outcomes, 8(1), 126. Kaye, E. K., Valencia, A., Baba, N., Spiro, A., Dietrich, T., & Garcia, R. I. (2010). Tooth loss and periodontal disease predict poor cognitive function in older men. Journal of the American Geriatrics Society, 58(4), 713-718. Kassebaum, N. J., Bernabé, E., Dahiya, M., Bhandari, B., Murray, C. J. L., & Marcenes, W. (2014). Global burden of severe tooth loss: a systematic review and meta-analysis. Journal of dental research, 93(7_suppl), 20S-28S. Lexomboon, D., Trulsson, M., Wårdh, I., & Parker, M. G. (2012). Chewing ability and tooth loss: association with cognitive impairment in an elderly population study. Journal of the American Geriatrics Society, 60(10), 1951-1956. Watt, R. G., Tsakos, G., De Oliveira, C., & Hamer, M. (2012). Tooth loss and cardiovascular disease mortality risk–results from the Scottish Health Survey. PloS one, 7(2), e30797. Saintrain, M. V. D. L., & de Souza, E. H. A. (2012). Impact of tooth loss on the quality of life. Gerodontology, 29(2). Savoca, M. R., Arcury, T. A., Leng, X., Chen, H., Bell, R. A., Anderson, A. M., ... & Quandt, S. A. (2010). Severe tooth loss in older adults as a key indicator of compromised dietary quality. Public health nutrition, 13(4), 466-474. Andersson, L., Andreasen, J. O., Day, P., Heithersay, G., Trope, M., DiAngelis, A. J., ... & Hicks, M. L. (2012). International Association of Dental Traumatology guidelines for the management of traumatic dental injuries: 2. Avulsion of permanent teeth. Dental Traumatology, 28(2), 88-96. Gupta, S., Kumar-Jindal, S., Bansal, M., & Singla, A. (2011). Prevalence of traumatic dental injuries and role of incisal overjet and inadequate lip coverage as risk factors among 4-15 years old government school children in Baddi-Barotiwala Area, Himachal Pradesh, India. Med Oral Patol Oral Cir Bucal, 16(7), e960-5.